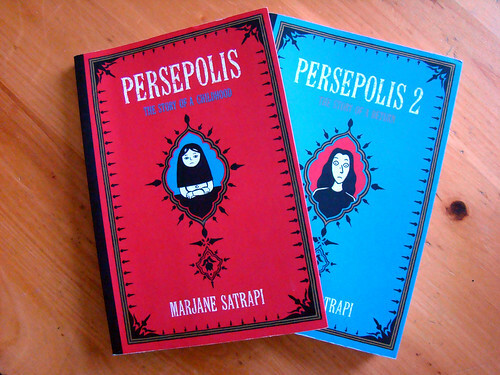 Reading Lu’s review of Embroideries by Marjane Satrapi reminded me that I had never read the second part of Persepolis. In a rare stroke of luck I found that I still had both books (borrowed ages ago from a friend…!) and plenty of time to read, between the other night and the slowest shift at the theater yet this fall, and a chunk of yesterday afternoon free. I was just as blown away the second time round as the first. As a graphic novel, Satrapi’s work delivers on every level. Her use of line and black and white is so vivid. Her images, while simple, burst with emotion. And of course the story of her life – growing up in Iran during the Islamic Revolution, followed by her separation as a 13 year old from her parents, and her experiences in Vienna – is fascinating. Satrapi’s work is amazingly understated. She presents her life in stark black and white, while in reality it was nowhere near simple. As the child of radical parents, and surrounded by a constant flow of revolts, wars, and religious tyranny, her childhood was a difficult struggle to keep up, to try to understand. Her own shifting ideals provide an amazing glimpse into a world that is hard for me to even comprehend. Satrapi’s gift is that she can take this unfamiliar reality and make it accessible by just telling it like it happened – there she was, a girl, a normal kid in a far from normal situation, who had hopes and dreams like anyone else, like myself. This is how she coped, this is how she grew up, and this is how she survived. I loved Persepolis, too! And one of these days I’m planning to revisit it – I always rush through graphic novels too quickly, and need re-reads to really appreciate the craftsmanship that goes into them. Emily – I rush as well – something about the pictures just pulls my eyes along. But something about the pictures also makes for easy re-reads. You always notice something different. Lu – Thanks for the little push I needed!